The present invention relates to the use of a microencapsulated composition for cockroach-controlling, wherein an insecticide having a 3-phenoxybenzyl group and phenylxylylethane are encapsulated in microcapsules having a polyurethane wall which have an average particle diameter of not more than 80 µm, a wall thickness of not more than 0.3 µm and a value of the average particle diameter/wall thickness of 100-400. At present, formulations such as emulsifiable concentrate, solubilized emulsion concentrate and oil solution which contain, for example, an organophosphorus insecticide or pyrethroidal insecticide as an active ingredient are used for the residual spray. Especially residual efficacy and safety are desired factors to formulations used for the residual spray. If the residual efficacy is to be enhanced with the conventional formulations such as emulsifiable concentrate, solubilized emulsion concentrate and oil solution, a high application dosage is required, which may bring about problem in safety. Thus, formulations being safer and being greater in efficacy are increasingly demanded. Under the circumstances, research and development of so-called microencapsulation technique that an active ingredient is enclosed in a wall material have become intensive. As microencapsulated insecticides, those which contain organophosphorus insecticide as an active ingredient are disclosed in JP-A-62-161706 and those which contain pyrethroidal insecticide as an active ingredient are disclosed in JP-B-55-38325. In the case when the active ingredient is a pyrethroidal insecticide, an organic solvent may be added as so-called cosolvent when the insecticide is mixed with a polyfunctional isocyanate which is sometimes high in viscosity, since this insecticide is generally high in viscosity and sometimes is in the form of crystal. It is mentioned in JP-B-55-38325 that, for example, as usual organic solvents, there may be selected hydrocarbons such as xylene, toluene, hexane and heptane, chlorinated hydrocarbons such as carbon tetrachloride and chloroform, ketones such as methylisobutyl ketone, methyl ethyl ketone and cyclohexanone and esters such as diethyl phthalate and n-butyl acetate. From GB-A-2 187 957 it was known to use insecticidal and/or acaricidal compositions for agricultural uses. 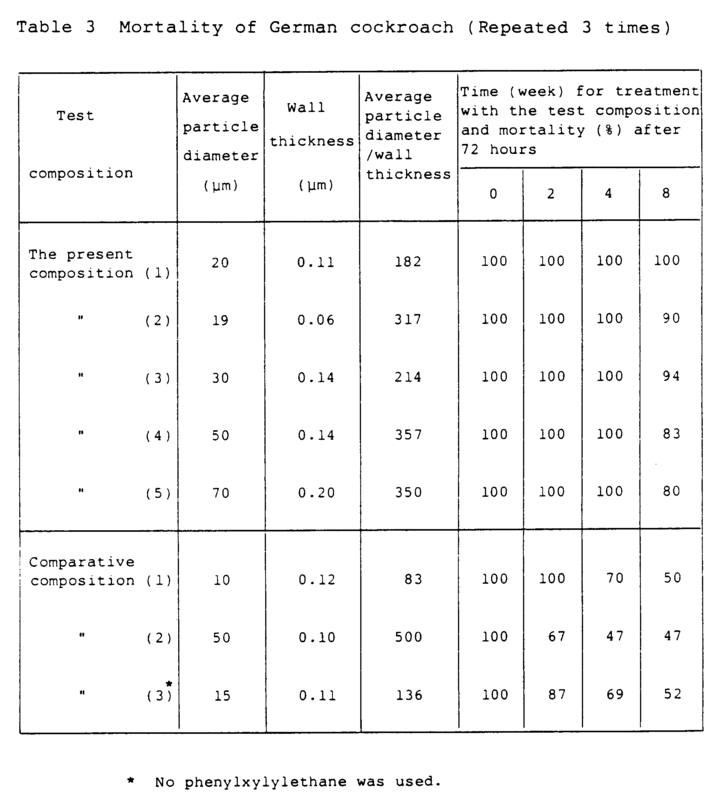 In this connection test examples are described according to which cabbages and kidneys onto which tobacco cut-worm larvae and carmine mites had been placed were treated with the known compositions. Additionally, in the object underlying that prior art there was included the intention to meet a demand of the development of a formulation for reducing a fish toxicity. Accordingly, that document has no relation to the controlling of cockroaches. In Chemical Abstracts, vol. 91, no. 11, abstract no. 85120r, there is reported, among others, on the evaluation of incapsulated pyrethrines for German cockroach. No particulars are given there in respect of the type of microcapsules, like their chemical composition or their dimensions. The inventors have made intensive study on optimum ranges of particle diameter and wall thickness of microcapsules and on selection of optimum organic solvents when an insecticide having a 3-phenoxybenzyl group is encapsulated as a core material in a polyurethane wall and then this is used for cockroach-controlling. As a result, it has been found that some insecticides having a 3-phenoxybenzyl group microencapsulated as a core material in a polyurethane wall using phenylxylylethane as a cosolvent have residual efficacy for a prolonged period of time for cockroach-controlling. wherein Z represents an oxygen atom or a -CH₂- group, R¹¹ represents a lower alkoxyl group (e.g. C₁-C₅ alkoxyl group), a chlorine atom, a bromine atom or a fluorine atom, R¹² represents a hydrogen atom or a lower alkyl group (e.g. 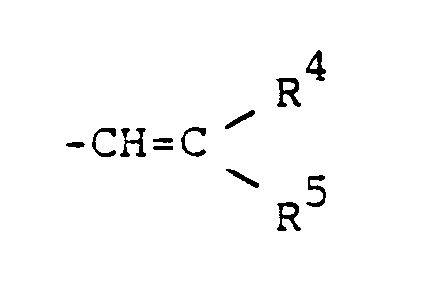 C₁-C₂ alkyl group) and R¹³ represents a lower alkyl group (e.g. 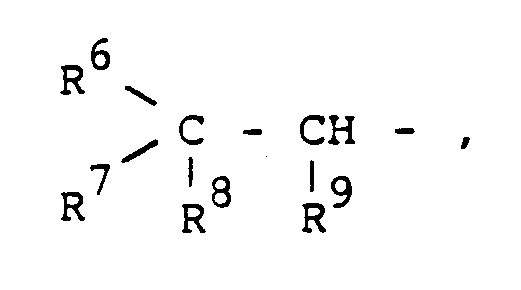 C₁-C₂ alkyl group) or a trifluoromethyl group. Phenylxylylethane, one of the essential elements of the present invention, is found among cosolvents for preparing a homogeneous solution of the active ingredient (I) and the polyfunctional isocyanate when a polyurethane wall is prepared by an interfacial polymerization method. As cosolvents, there may be used various organic solvents as disclosed in JP-B-55-38325, but those which are high in flash point and less in irritating smell are preferred from a viewpoint of safety and prevention of disaster. Surprisingly, the microencapsulated composition of the active ingredient (I) prepared by using the phenylxylylethane as a cosolvent has residual efficacy for cockroach-controlling superior to that of the microencapsulated composition of the active ingredient (I) prepared by using other organic solvents such as methyl isobutyl ketone and cyclohexanone or without using any organic solvent. The microencapsulation is performed, for example, by the method that a hydrophobic solution containing a polyfunctional isocyanate, active ingredient (I) and phenylxylylethane is dispersed in an aqueous solution containing a water-soluble polymer as a dispersing agent in the form of droplets, and then a polymerization reaction with a polyhydric alcohol having at least two hydroxy groups is allowed to run. After the encapsulation reaction is over, the resulting capsule suspension as such is diluted with water so as to obtain a desired concentration and, if necessary, a suspension stabilizer is added to obtain a stable slurry formulation. As the polyhydric alcohols having at least two OH groups, mention may be made of, for example, ethylene glycol, propylene glycol, butylene glycol, hexanediol, heptanediol, dipropylene glycol, triethylene glycol, glycerin, resorcin and hydroquinone. As the polyfunctional isocyanate, mention may be made of, for example, toluene diisocyanate, hexamethylene diisocyanate, adducts of toluene diisocyanate and trimethylolpropane, self-condensates of hexamethylenediisocyanate, SUMIDUR L ® (made by Sumitomo-Bayer Urethane Co., Ltd.) and SUMIDUR N ® (made by Sumitomo-Bayer Urethane Co., Ltd.). 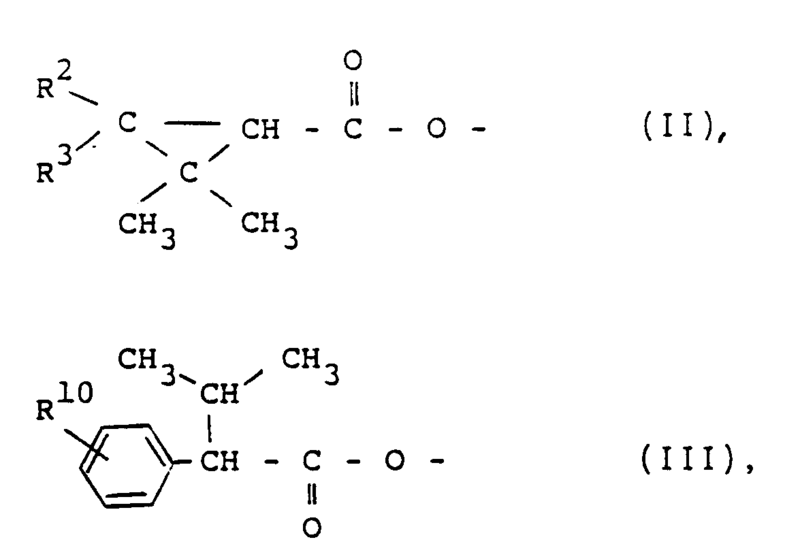 The dispersing agents used for dispersing a hydrophobic solution containing active ingredient (I), phenylxylylethane and polyfunctional isocyanate include, for example, natural polysaccharides such as gum arabic, semi-synthetic polysaccharides such as carboxymethyl cellulose and methyl cellulose, synthetic polymers such as polyvinyl alcohol and fine mineral powders such as magnesium aluminum silicate. They may be used alone or in combination of two or more. When dispersibility is weak, this may be improved by adding a known surfactant such as given in H. Horiguchi, "Synthetic Surface Active Agent". When the addition amount of phenylxylylethane is too small, development of efficacy is insufficient, and when too big, the concentration of active ingredient decreases. Therefore, the addition amount of phenlyxylylethane is usually 0.2-5 parts by weight per part by weight of active ingredient (I). The average particle diameter of microcapsules is determined depending on varieties and concentration of dispersing agent used for dispersion and on the degree of mechanical agitation during dispersion. For measurement of average particle diameter, the Coulter counter Model TA-II (available from Nikkaki) may be used, for example. The wall thickness of microcapsule varies depending on volume ratio of the core material to the wall material and is obtained from the following approximate equation. Ten gram of "SUMIDUR" L ® (as indicated herebefore) and 100 g of "HISOL" SAS-296 ® (1-phenyl-1-xylylethane made by Nippon Petrochemicals Co.) were added to 100 g of cyphenothrin and stirred until a uniform solution was obtained. This solution was added to 350 g of an aqueous solution containing 5 % by weight of gum arabic as a dispersing agent, and stirring was carried out for several minutes by means of "T.K. autohomomixer" (commercial name, Tokushukika Kogyo Co.) at room temperature until microdrops were formed. The revolution rate was 8000 rpm. Then, to the dispersed solution was added 10 g of ethylene glycol and the reaction was allowed to proceed with gently stirring in a constant temperature bath at 60°C for 24 hours to obtain suspension of a microencapsulated composition. Eight gram of "SUMIDUR" L ® (as indicated before) and 100 g of "HISOL" SAS-296 ® (as indicated before) were added to 100 g of fenvalerate and stirred until uniform solution was obtained. This solution was added to 350 g of aqueous solution containing 5 % by weight of gum arabic as a dispersing agent, followed by stirring for several minutes by a homomixer (as indicated before) at a revolution rate of 4700 rpm at room temperature until microdrops were formed. Then, to the dispersed solution was added 10 g of ethylene glycol and the reaction was allowed to proceed with gentle stirring in a constant temperature bath of 60°C for 24 hours to obtain suspension of microencapsulated composition. Seven gram of "SUMIDUR" L ® (as indicated before) and 20 g of "HISOL" SAS-296 ® (as indicated before) were added to 100 g of d-phenothrin and stirred until uniform solution was obtained. This solution was added to 200 g of an aqueous solution containing 5 % by weight of gum arabic as a dispersing agent, followed by stirring for several minutes by a homomixer (as indicated before) at 6400 rpm at room temperature until microdrops were formed. Then, to the dispersed solution was added 12 g of ethylene glycol and the reaction was allowed to proceed with gentle stirring in a constant temperature bath of 70°C for 18 hours to obtain a suspension of microencapsulated composition. To the suspension was added an aqueous solution containing 20 % by weight of neutralized "AGRISOL" FL-100F ® (Kao Soap Co., Ltd.), thickener in form of an acrylic polymer, to make a total weight of 1000 g to obtain a slurry of microcapsules wherein 10 % by weight of cyphenothrin is encapsulated (present composition (8)). To the suspension was added an aqueous solution containing 0.4 % by weight of xanthane gum and 0.8 % by weight of magnesium aluminum silicate to make a total weight of 1000 g to obtain a slurry of microcapsules wherein 5 % by weight of fenvalerate is encapsulated (present composition (9)). Twentytwo gram of 'SUMIDUR" L ® (as indicated before) and 100 g of "HISOL" SAS-296 ® (as indicated before) were added to 100 g of cyfenothrin to make a uniform solution. This solution was added to 400 g of an aqueous solution containing 10 % by weight of polyvinyl alcohol as a dispersing agent, followed by stirring for several minutes by a homomixer (as indicated before) at 3500 rpm until microdrops were formed. Then, to the dispersed solution was added 20 g of ethylene glycol and the reaction was allowed to proceed with gentle stirring in a constant temperature bath of 60°C for 24 hours to obtain suspension of microencapsulated composition. Six gram of "SUMIDUR" L ® (as indicated before) was added to 100 g of cyphenothrin to make a uniform solution. This solution was added to 400 g of an aqueous solution containing 10 % by weight of polyvinyl alcohol as a dispersing agent, followed by stirring for several minutes by T.K. homomixer (as indicated before) at 2700 rpm until microdrops were formed. Then, to the dispersed solution was added 6 g of ethylene glycol and reaction was allowed to proceed with gentle stirring in a constant temperature bath of 60°C for 24 hours to obtain a suspension of microencapsulated composition. Example 6 was repeated except that acetophenone was used in place of the "HISOL" SAS-296 ® (as indicated before), thereby to obtain a slurry of microcapsules wherein 10 % by weight of fenvalerate is encapsulated (comparative composition (5)). Example 6 was repeated except that cyclohexanone was used in place of the "HISOL" SAS-296 ® (as indicated before), thereby to obtain a slurry of microcapsules wherein 10 % by weight of fenvalerate is encapsulated (comparative composition (6)). 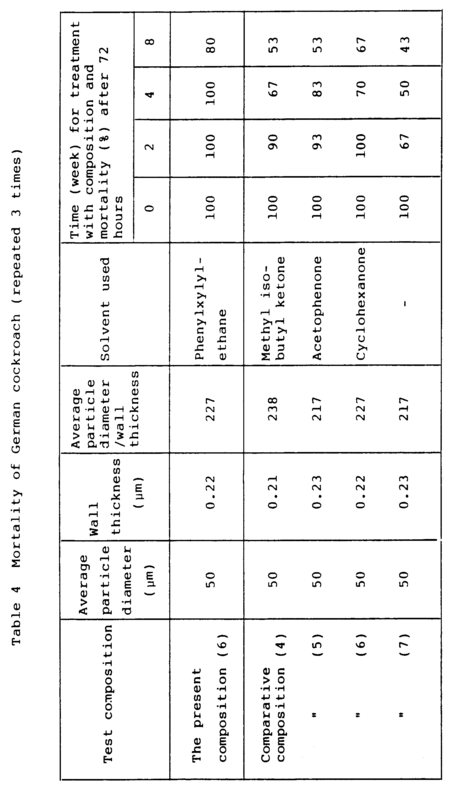 Furthermore, the mortality after lapse of 2, 4 and 8 weeks was obtained using the same sprayed surfaces. Furthermore, the mortality after a treatment for 2, 4 and 8 weeks was obtained using the same applied surfaces. in which R⁴ represents a methyl group, a chlorine atom, a bromine atom or a fluorine atom, R⁵ represents a methyl group, a trifluoromethyl group, a chlorine atom, a bromine atom or a fluorine atom, and R⁶, R⁷, R⁸ and R⁹ are the same or different and each represent a chlorine atom, a bromine atom or a fluorine atom, and when R² is a methyl group, R³ represents a methyl group, R¹⁰ represents a chlorine atom, a bromine atom, a fluorine atom, a trifluoromethoxy group, a difluoromethoxy group or a 3,4-methylenedioxy group, Z represents an oxygen atom or a -CH₂ - group, R¹¹ represents a lower alkoxy group, a chlorine atom, a bromine atom or a fluorine atom, R¹² represents a hydrogen atom or a lower alkyl group, and R¹³ represents a lower alkyl group or a trifluoromethyl group, for cockroach-controlling. The use according to Claim 1, wherein the insecticidal compound is (RS)-α-cyano-3-phenoxybenzyl (1R)-cis, transchrysanthemate. The use according to Claim 1, wherein the insecticidal compound is (RS)-α-cyano-3-phenoxybenzyl (RS)-2-(4-chlorophenyl)-3-methylbutyrate. The use according to Claim 1, wherein the insecticidal compound is 3-phenoxybenzyl (1R)-cis, trans-chrysanthemate. 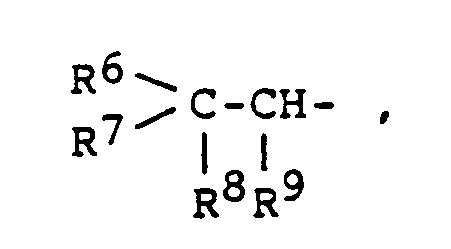 The use according to Claim 1, wherein the insecticidal compound is 3-phenoxybenzyl (1RS)-cis,trans-3-(2,2-dichlorovinyl)-2,2-dimethylcyclopropane-carboxylate. The use according to Claim 1, wherein the amount of phenylxylylethane is 0.2 - 5 parts by weight per part by weight of the insecticidal compound.